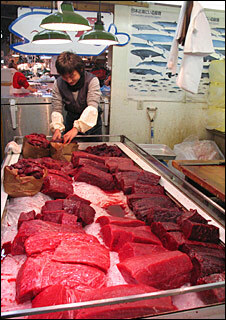 Iceland and Norway recently began exporting whale meat for sale in Japan. Photo: via BBC. Image may be subject to copyright. Fishermen slaughter a 10m-long bottlenose whale at the Wada port in Minami-Boso city, Chiba prefecture, east of Tokyo. Photo: AFP. Image may be subject to copyright. Dolphins and penguins are dying too! Obstruction by a hardline anti-whaling group has forced Japan to cut short its Antarctic whale hunt, the fisheries minister said on Friday, the first time the fleet is heading home early due to clashes with activists. ANCHORAGE, Alaska — The state of Alaska sued Friday to overturn the listing of beluga whales in Cook Inlet, home to the Port of Anchorage, as an endangered species. The lawsuit, filed in Washington, D.C., claims the federal government overreached and did not follow its own laws two years ago when it placed the white whales on the endangered species list. The National Oceanic and Atmospheric Administration in October 2008 announced the listing for Cook Inlet belugas, one of five populations off the shores of Alaska. NOAA fisheries officials said at the time that Cook Inlet belugas were not recovering despite protections already in place. The population declined by 50 percent between 1994 and 1998. State officials say the population has stabilized and is showing signs of recovering. TAIJI, Japan — Dolphin hunters in a Japanese fishing town on Monday defended their annual cull after “The Cove”, a hard-hitting film about the slaughter, won the Academy Award for best documentary. Every year, fishermen in Taiji herd about 2,000 dolphins into a secluded bay, select several dozen for sale to aquariums and marine parks and harpoon the rest for meat, a practice long deplored by animal rights activists. The team that shot “The Cove” over several years often worked clandestinely and at night to elude local authorities and angry fishermen, setting up disguised cameras underwater and in forested hills around the rocky cove. Individual fishermen in Taiji routinely decline to speak to foreign media, but they have the support of many local people in the town of 3,700 who defend hunting dolphins, porpoises and small whales as a centuries-old tradition. “Hunting of cetaceans in Taiji is being carried out appropriately under the fisheries laws and with the permission of Wakayama prefecture, and there is nothing illegal about it,” both statements said. Many people feel the same way in the southwestern town, which celebrates dolphins and whales with several sculptures and murals and a museum. “They shot angry fishermen, but it’s natural that the fishermen get angry if they are disturbed when they’re doing their job,” he said. The film also highlights the health threat posed by high levels of mercury found in dolphin meat, which used to be served in local school lunches. Local assemblyman Hisato Ryono, who years ago raised the alarm about the health threat to children, was interviewed in the documentary but now opposes “The Cove,” arguing that it emotively distorts the issue. One of the activists behind “The Cove”, the co-author of the book on the film, Hans Peter Roth, was back in town on Monday. “I tried to talk to residents, but couldn’t,” he told AFP, adding that he thought dolphin-watching trips, rather than hunts, could boost tourism. “Westerners equally treat animals badly,” said Roth, who added that as a journalist in Switzerland he had filmed the slaughter of cows and pigs. O’Barry added: “We like the Japanese people and there’s no Japan bashing from this film. The Japanese people have a right to know. As a Norwegian native I am appalled that my country still allows whaling. I hope to change this, by telling the government to rethink what they are doing in their slaughter of these beautiful creatures. But I need support in my case, and I hope that you and everyone you know who support this cause, to sign my petition to stop Norwegian whaling. Thank you! NEW YORK (Reuters) – A tense new film shows Japanese fishermen luring thousands of wild dolphins into a hidden secret cove in Japan where activists say they are captured for marine amusement parks or slaughtered for food. “The Cove” follows a team of activists including former dolphin trainer from the “Flipper” television series Ric O’Barry. The film has already been praised by critics and won the audience award at this year’s Sundance Film Festival. “Eco-activist documentaries don’t get much more compelling than ‘The Cove’,” said Variety’s review. O’Barry, who has been visiting Taiji several times a year for the past eight years and now wears disguises in the town to avoid the attention of fisherman and the police, predicted the film would have a big impact. “When the film is seen in Japan, it will shut ‘the cove’ down permanently,” he said in a recent interview. The 69-year-old says he began fighting against the captivity of dolphins when one of the dolphins he trained for the hit 1960s television show “Flipper” voluntarily stopped breathing until it died. The film turns into a gripping action-adventure using hi-tech cameras to film the efforts of Psihoyos and a team including underwater sound and camera experts as well as champion free divers to film inside the cove. She added Japan complied with laws that advise pregnant women against eating seafood, including dolphin meat, with high levels of mercury, and would investigate assertions in the film that dolphin meat is sold in Japan disguised as whale meat. Dolphin hunts are largely driven by a multibillion dollar marine amusement park industry located in the United States and around the world, who pay up to $150,000 per dolphin, according to O’Barry. “People who see this movie are going to think twice before they buy a ticket to a dolphin show,” he said. Ultimately the film is part of a larger story of the destruction of the oceans and planet, the filmmakers said.